I wanted to do lactofermented pickles, so first I needed to get whey. 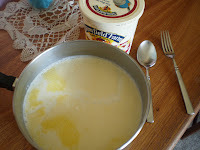 Whey is the byproduct of making cream cheese from yogurt. So making yogurt is the first step. Whole milk and yogurt from the health food store. Both are from the bottom about-to-expire shelf on the dairy section. It’s illegal in Montana to sell raw milk, and we don’t ‘own our own cow’ through a milk share program any more because we’re mostly dairy free and just couldn’t use it any more. Non0homogenized is the best I can do. 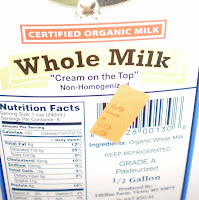 , I’ll just go ahead and direct you to Kelly’s post on the subject if you’re not familliar with why raw real whole milk is the best. 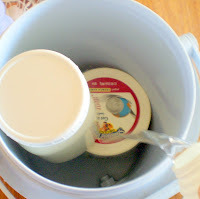 I’m just here to show you pictures of how to make yogurt. You only need a dab of yogurt to culture the entire half gallon of milk into yogurt. I spread most of it into ice cube trays to freeze for next time and left about 2 tablespoons in the bottom of the container for this batch. This is french vanilla organic yogurt with live cultures. 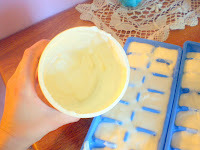 I’ve used cheap plain Walmart yogurt before, and it works just fine. The main thing is you need the live cultures. Heat the milk in a heavy pot. I heat it over medium low until it’s just barely too hot to touch. Then allow it to cool until it’s comfortable to touch. Any warmer than this and you might kill the cultures. Next mix in either 2 cubes of yogurt (thawed, not in the microwave!) or the dab that’s left in the bottom of your yogurt container. 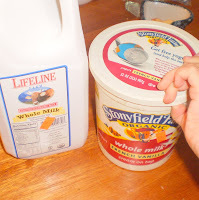 Mix it in with a fork or whisk to get it all spread through the warm milk. 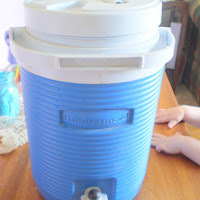 Put the filled containers in a cooler and add warm/hot water to the bottom. You want them to stay warm. I go ahead and add water to about an inch below the lid of the lowest container (don’t want water in my yogurt). I usually do this in a big cooler, but since I was only doing half a gallon today and I was too lazy to go out to the garage, I used hubby’s lunch water cooler. Close the lid as much as possible. I also draped a towel over the whole thing. I did the yogurt mixing part during nap time, then changed the water out for hot water again before going to bed. You want it to stay warm so the yogurt cultures. And in the morning we have yogurt. You can refrigerate it, or do what I did and turn it into whey and cream cheese. Where in Montana do you live? I live in Columbia Falls, MT. not too far from Glacier Park. I really enjoy your site! 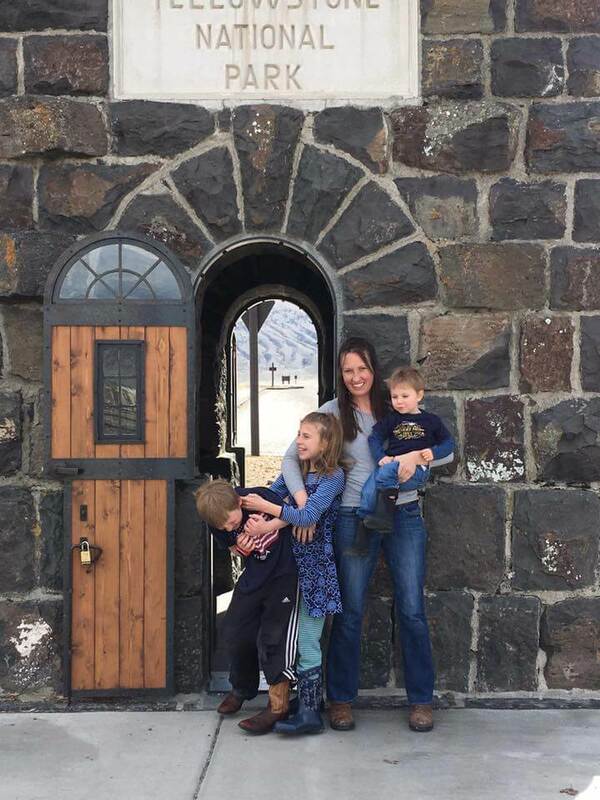 I am from Kalispell, and my twin sister lives in Helena :-)….my family and I are about to start the GAPS diet and I am so encouraged by this website. Thank you! Ok, making yogurt tonight for the first time! Can’t wait — so sick of paying almost $4 for a quart I can make so easily at home. (Haha, we’ll see about that!) I’ll let you know how it comes out. I did it! And it was so easy — thank you. 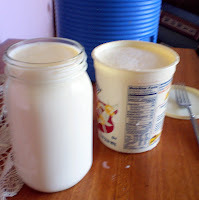 I heated the milk to 110 degrees (I have to measure everything), let it cool to the touch, poured it into my ball jars, added 2T yogurt (stoneyfield hi fat cream on top) to each jar, closed the lid. I put in a cardboard box under my side table with one of those silver car-repair lamps and a 60 watt bulb, left it there overnight. The next day, I had yogurt. It’s like a miracle — I’m so easily impressed, lol. And a day in the fridge made it as thick as the storebought. I used raw milk, by the way so I’m lovin’ it. Thanks for getting me started! I am trying this right now. I have been working with my Lyme Disease which has left me dairy-free & often too tired to make food for myself. I must have made progress if I am here! Yay! I’m really into the idea of raw milk & seem to be doing OK with Organic Pasture’s Colostrum Qefir, so I’m REALLY hoping I can do yogurt! I miss milk! Ha. I’m heating the milk right now & kind of confused about why. It seems like it goes against the whole ‘raw’ idea. Is it simply because it needs to be warm so that the cultures will grow?? i found your site to be a wealth of relevant information to the subject i have been searching for? thankyou for you effort and time in prividing this great information..
I’m going to make my first batch of yogurt tomorrow so that I have whey to make sauerkraut. I have a square cooler that I can put in up to 4 quart jars. Are you saying I should put in that much hot water so come to 1″ of the top? How hot? I assume not hotter than I just cooled my milk so as not to disturb the cultures? Or is warmer than that OK with the bulk? I’m making this for GAPS if that has any play in it all. I don’t want to waste the milk but trying this before buying a yogurt maker. :) Thanks!! Hi Cars, thank you so much for this tutorial, as well as your fantastic GAPS ebook. A real life saver! I’m picking up 5 litres of fresh goats milk tomorrow, and one of the first things I want to do is make yoghurt. So excited! Quick question… Is the milk still raw if it is heated to 110deg? What is the purpose of this step?